​Lake Miona Recreation Center was a hub of activity as 83 artists/artisans displayed their talents on Saturday during The Villages Art League's annual show. All rooms were filled with a wide variety of subjects. Some artists demonstrated their crafts. Background music was provided by flute, dulcimer and piano players. 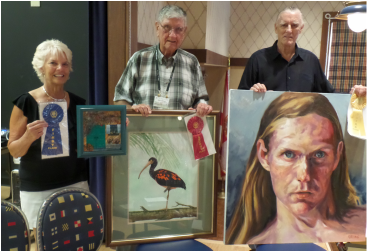 At 3 o'clock, People's Choice Awards were presented to Ellen Hellwege 1st place, John O'Hara 2nd place, Roger Sherman 3rd place. Honorable Mentions were won by Connie Gray, Phyllis Speicher and Jeanne Willette. To read the Villages-News.com summary of the event click here.